Nineteenth Century America. Indian Nations across the continent were swept aside on a tide of Manifest Destiny as ‘civilisation’ pushed westwards, until, towards the end of the century, the frontier was declared closed. And Indians suffered untold hardship and tragedy during what has been called the ‘American Holocaust’. Three arduous journeys from different periods of the 19th century and different parts of the continent tell an Indian history of this turbulent period, but from a deeply personal perspective. Lee Miller is of Kaw and Delaware Indian descent and an adopted Cherokee with roots in the Cherokee’s Quallah Boundary Reservation in the Appalachian Mountains of North Carolina and Tennessee. Lee is a historian, anthropologist, writer and lawyer. She has spent time on almost every reservation in America, her deep knowledge and understanding gaining her unprecedented access. As Head of Research for Kevin Costner’s epic ‘500 Nations’ series for PBS, she extended her contacts amongst tribes right across America. By retracing three tragic journeys made by three different Indian nations in the 19th Century, Lee will uncover three extraordinary stories of Indian history. In each program, Lee makes one of these journeys, following the forced relocation of a tribe from their ancestral grounds to an uncertain future, as America cleared the path for modern civilisation. On the way, she’ll uncover the history that led to the journey. Traditional elders and children from each tribe will accompany her along key parts of the journey. And the elders, with their vibrant oral history tradition, retain ‘first-hand’ experiences of these journeys, much not contained in written histories. She’ll discover sites along each trail full of meaning for the descendants of those who made the journey, giving her a new perspective on her own heritage. She’ll follow the Trail of Tears, which led the Cherokee from the forests of North Carolina, Georgia and Florida to the plains of Oklahoma. She’ll trace the Long Walk of the Navajo, from ancestral grounds in Arizona to captivity in Fort Sumner in New Mexico. And she’ll make an incredible journey of over 1,000 miles, the Flight of the Nez Perce, escaping from the US cavalry by fleeing into Canada. Each story was a tragedy, yet each contained a spark of hope. The Navajo eventually returned to Arizona, united as never before by the ‘Long Walk’ so that today the Diné – the People – live encompassed by their four scared mountains. Many Cherokee hid in the forests and escaped the enforced march west. Their descendants still live in these forests today. The Cherokee lived in the mountains of Georgia, Tennessee and North Carolina, near the expanding centres of American civilisation along the eastern seaboard. They tried to adopt ‘civilisation’ themselves, even inventing a written language and publishing a newspaper. But, in 1830, President Andrew Jackson signed the Indian Removal Act, requiring all tribes east of the Mississippi to relocate to the west of the great river. In 1838, soldiers rounded up Cherokee men, women and children and marched them through a bitter winter to Oklahoma. More than 4,000 Cherokee died, overcome by cold and starvation. Those who reached Oklahoma formed a new branch of the tribe, the Western Band of the Cherokee, but bitter enmity between the Western and Eastern Bands resulted from conflict between the Cherokee leaders that had capitulated to American treaties and promises of land in the west, and those who held out. Only in the last few years have they begun to heal these rifts and unify the Aniyunwiya – the people – once more. In Arizona in the 1860’s, conflicts were escalating between the US army and the Navajo, so the US enlisted Kit Carson to put an end to Navajo resistance. Carson waged total destruction, a scorched earth campaign, burning hogans, killing livestock and, with the help of Ute Indians, rooting out the remaining bands of Navajo from their strongholds. Starved into submission, the remaining Navajo surrendered. In the spring of 1864, they were marched at gunpoint to Fort Sumner, 300 miles away in New Mexico. Most of the Navajo were already starving when they began the ‘Long Walk’, and 200 died along the way. But there were not enough resources at Fort Sumner to feed the Indians, especially since many imprisoned Apache were also sent there. After four gruelling years at Fort Sumner, the Navajo began the ‘Long Walk Home’. The US government granted them 15 million acres, bounded by their four Sacred Mountains, one of the very few tribes permitted to return to ancestral lands. Today, the Navajo Reservation covers 60 million acres of Arizona. By the summer of 1877, many of the Nez Perce tribe had been moved from their homelands in the Pacific North-west to reservations to clear the way for settlers. One group, under the leadership of Chief Joseph, left their home in the Wallowa Mountains to seek refuge with the Crow Nation. But the Crows refused to help, so Chief Joseph led his people on a trek of over 1,000 miles, to seek safety across the Canadian border. He planned to meet up with a band of Lakota, led by Sitting Bull, who had fled to Canada after their victory over Custer at the Battle of the Little Bighorn. The journey took the Nez Perce through the newly created Yellowstone National Park and north through Montana, holding off numerous attacks by the US army – Chief Joseph even gained a reputation amongst army commanders for his astute tactical decisions. But, short of supplies and ammunition, Chief Joseph had to surrender, just 40 miles south of the Canadian border. But the journeys of the Nez Perce were far from over. They were imprisoned in Kansas. 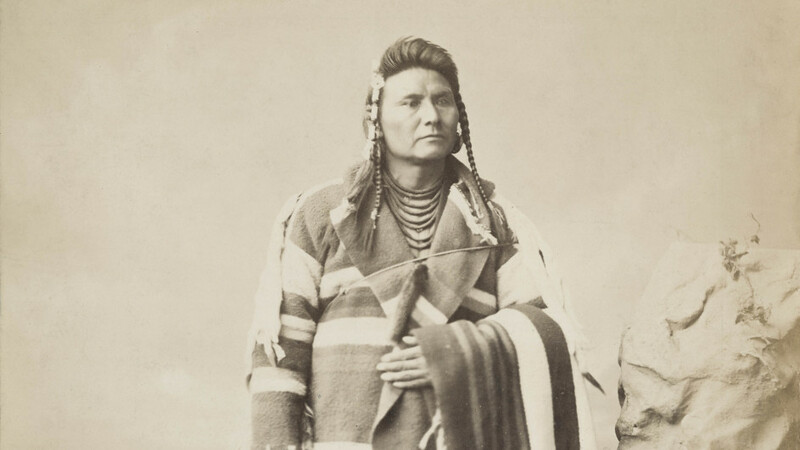 Chief Joseph went to Washington, to plead with the president to allow his people to return to the Wallowa Valley, but instead they were moved several more times around the US, until finally being allowed to settle in the Colville Reservation in Washington State, far from the Wallowa Mountains of Idaho. Chief Joseph’s journey is now commemorated as a National Historic Trail.